FreeBitco.in offers players a chance to win money in the form of bitcoins through playing games on the site. Bitcoin is a cryptographically secured form of digital cash known as cryptocurrency. Bitcoin is the preeminent cryptocurrency, the most popular and highest valued cryptocurrency in the market, it is redeemable in cash for players who would rather have their winnings in fiat money. Free Bitcoin rolled out its first cash payment to winners in 2014 after its inception in late 2013. Currently, FreeBitco.in has over 12 million users with a record of about 62.5 billion games with over 135,000 bitcoins paid out so far. Registering on the site, which enables users to partake in lottery draws and other games on the platform is free and anyone can join the games. 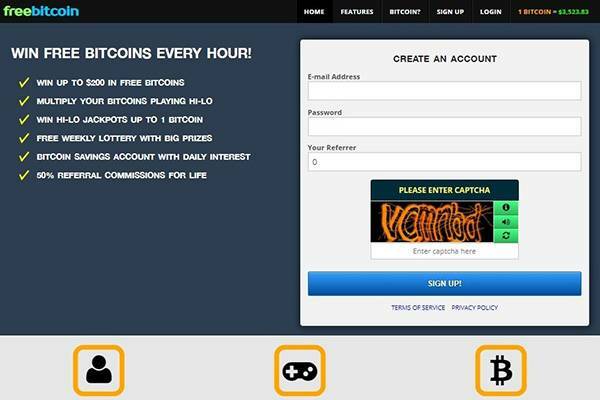 Registration is completed using the email address and afterwards, registered users can login and play games for bitcoins as they please. Upon login, the system operates a model that uses either of three captcha versions (version one, version two and solve media). The highest amount of money a user can win fluctuates with the exchange rate of bitcoin in the market. Even so, FreeBitco.in is expected to expand as the market price of bitcoin continues to increase. Rewards in the hourly games and lottery platforms winnings are paid in Satoshi (Bitcoins to the eighth decimal) and are redeemable in fiat currency. There are two ways main of making money on FreeBitco.in, the first way is through playing the hourly Hi Lo games on the app for which a user can win as much as $200 as hourly earnings for an unlimited period of time. These games include the Free BTC game and Multiply BTC game. In Free BTC, all a user has to do is fill in the captcha and press the roll button to roll a dice. The lucky number produced by the dice determines the amount of money a player gets based on the pay table. This game also has a Alarm system that when activated, rings at the end of a round to help users claim their prizes on time. Multiply BTC game is a Hi Lo game where a player chooses between the manual bet and auto bet feature to use in multiplying money won in Free BTC. For, the lottery games, a player receives 2 free lottery tickets for every FREE BTC roll played, 1 ticket for every roll from a referral and 1 ticket for every 0.00000500 BTC wagered in the Multiply BTC game. Users can also use their earnings to purchase these tickets. Essentially, active participation on the platform is rewarded with lottery tickets to participate in the lottery games which are drawn weekly. Also, users can make money by saving up cash in their FreeBitco.in account. A balance above 30000 Satoshi or 0.0003 BTC earns a user an interest at the end of every day. There are third party mobile applications available on Android platforms through which a user can access the FreeBitco.in games. However, it is unclear if these apps are approved by the website or if there is an official mobile app developed by the website itself. Players can also make money from FreeBitco.in from making referrals. The referral programs offers a 50% commission of the referral’s Free BTC game winning prize, a 0.25% of wager in the Multiply BTC game and a 25% daily commission on any interest earned by a referral. A free lottery ticket is also given out for every successful referral as well. All users are required to enter their bitcoin wallet address (public key) in their profiles as that is where the system transfers their earnings to. This address can be changed anytime from the profile as well. The platform offers a minimum withdrawal limit of 0.00030000 BTC with a transaction fee charged at 0.00030000 BTC as well. The platform offers 3 types of funds withdrawal method; auto withdraw, instant withdraw and manual withdraw. If auto withdrawal is activated, bitcoins are credited to a users wallet automatically on Sundays. In manual withdrawal, the bitcoins are sent to a user’s wallet within six hours of manually sending a request while in an instant withdrawal, the bitcoins are transferred to a user’s wallet within 15 minutes of initiating a request. 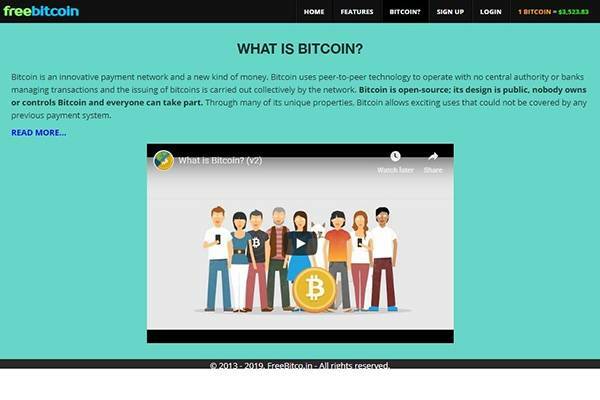 Is the site FreeBitco.in legit? With an Alexa rating of 1025 and an estimate of 100 million monthly visitors, FreeBitco.in is clearly a popular bitcoin faucet. It is ranked as the second most popular lottery site as over the world and is most popular in Russia amassing almost 10% of the total number of visitors to the site. The site is also relatively popular in Brazil, India, Iran and the United States of America. FreeBitco.in is secured by Google Safebrowsing and Norton Safe Web with an excellent rating based on trustworthiness and privacy. However, there are a few negative reviews online about the site especially concerning delay in payment of winnings. All in all, FreeBitco.in seems like a legit and reputable site for anyone looking to earn some bitcoins. 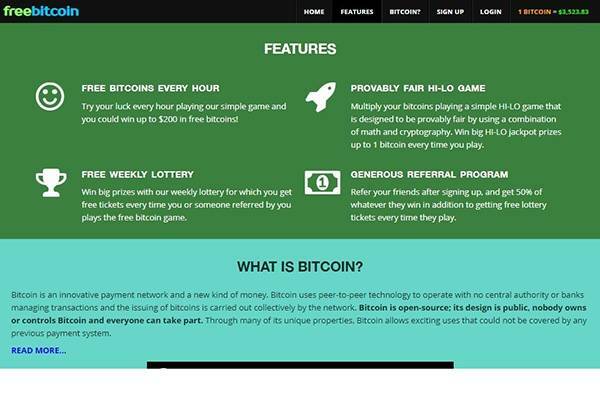 FreeBitco.in is a credible bitcoin faucet and lottery website used by millions of people all over the world who are interested in earning some bitcoins. Though the winnings are relatively small when compared to other lotteries worldwide, it is free to join and is open to everyone so essentially, users have almost nothing to lose. Furthermore, if the current upsurge in bitcoin value is anything to go by, then FreeBitco.in is definitely the lottery site to try out.